Kawaii Yoko cats Neko and Mia celebrate Christmas. They received lots of gifts! What’s in the boxes? DIGITAL High Quality PDF file (without the logotype watermark). Best for standard A4 paper size (21x29.7 mm, 8.3x11.7 inches). Ready for printing and colouring in! Cat Colouring Pages & Cat Drawings for Adults. Anti-Stress Cat Colouring Therapy. Life Organising With Cute Cat-Themed Planner Inserts & Printables For Every Day. 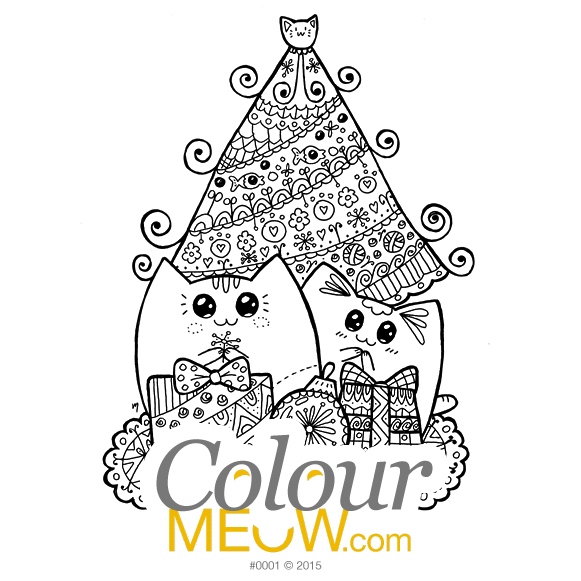 Colour Meow cat colouring pages are for Personal Non-commercial use only. You can print several copies for yourself or a group. You may NOT sell, distribute, alter, or modify Colour Meow artwork. Just ask, if not sure. When sharing on the Internet and social networks, you must keep our web address in the picture. Ozzi Cat magazine - Learn how to make cats live a happy life, read inspiring stories about cats and hero cat lovers. Brings warmth to your heart and highlights your day!